We already described the CDR feature in Why using CDR / 3R / Clock-Data Recovery. writing "up to 100km"? Is the question everyone has in mind while reading this sentence. That is exactly what this article is about. We need to define some technical parameters and I would like to tell you what we already tested. This means, that the guaranteed power budget is 26dB but the dispersion tolerance is only 1.600ps/nm. Standard G.652 Singlemode Fibers have 18ps/km Chromatic Dispersion which leads to 88km with a dispersion tolerance of 1.600ps/nm. If you have a dispersion optimized fiber you might reach out longer. 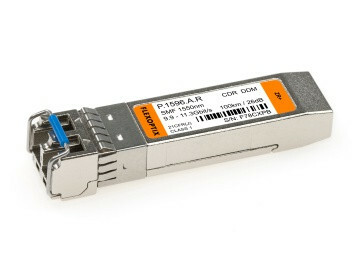 We used 100km of standard G.652 fiber and a P.1596.A.R. Our receive level was at -17,5 dBm and 10.3 Gbit/s (10G Ethernet). We did a BERT (bit-error-rate-test) with a Standard 2^31-1 PRBS and reached a BER of 10^-12. Reducing the light level lead to bit-errors. A Bit-Error-Rate of BER 10^-12 means 1 bit-error every 100 seconds. If the input power value is high enough you might reach the 100km. If the input power values will be lower there are just up to 88km possible.